The Weather Channel finally joined the cool kids and released a free weather app. The downside? Its ad-supported. Things could be worse as the ads aren't overly intrusive, and it beats the $3.99 tag for the premium version. The free version is essentially the same as the premium that we've seen before, only with ads. 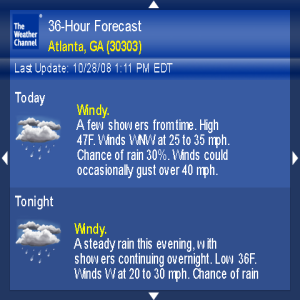 The app lets you view current conditions, hour and 36-hour forecasts, view severe weather alerts, and more. If you're looking for a great free weather app, you really can't beat the best. You can download the free versions OTA from the links below. The premium version is also still available in BlackBerry App World for $3.99.